We're a company that connects with people on a level that runs deeper than signed contracts and filled purchase orders. “Grown in Trust” is our mantra and we stay true to this promise with the growers we choose to work with. While most of our produce comes from Western Canada, we source and grow products with partners from all over the planet. We work with fair practice growers who look after workers, their lands and the environment all while operating third-party certified, food safe farms. When you buy produce from Thomas Fresh, you’re buying from established farms that have passed rigorous third-party inspections and who have maintained a good safety record. We can supply you with potatoes from all four Western Canadian provinces; root crops from America’s Pacific Northwest and California and celery, onions, lettuce, and other conventional produce from respected farms located across North America and Asia. Thomas Fresh sources organics from North America and around the world. Our local growers produce a whole line of organic products. In Asia, we work with the Dongsheng Agricultural Group that operates eight farms, including two organic farms in citrus and pear growing regions. Sister companies to Thomas Fresh, Barrich Farms and True North Seed are a strategic alliance between two companies near Outlook, Saskatchewan. Both groups lovingly tend to a variety of conventional and seed potatoes spread over 2,500 acres of irrigated land. 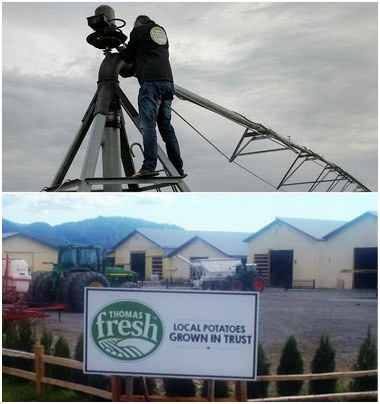 A significant portion of this land is used to grow local Thomas Fresh potato varieties each season. Sam Dhillon Farms is a unique Thomas Fresh partner-grower located in beautiful British Columbia. With beginnings in 1978, this third-generation family farm grows over 850 acres of delicious produce. Their luscious fields include a variety of potatoes, squash, zucchini and jalapenos. Flying Dust is a 1200-member First Nations Reserve located 300 kms northwest of Saskatoon. Flying Dust contains The FD Riverside Market Garden, a 65-acre farm who collaborates with Thomas Fresh to grow potatoes, onions and carrots each season. Sharing similar values to Thomas Fresh, the Riverside Garden works very closely with their community, hiring 16 employees each year – their mission: “feed the land to feed the people”. Thomas Fresh is always seeking established growers with quality produce. We ship and repack conventional, specialty, and organic produce and we’re always looking for new growers to partner with. While we supply one of the largest varieties of exotic produce in Canada, we are always seeking more varieties. If you’re interested in becoming a grower for us, you’ll need to have your farm inspected and certified by Canada GAP, USDA GAP, or Global GAP. Organic growers need to complete third-party inspections by approved organizations. We recommend that our growers have farm traceability programs in place for storage alignments, so we can trace every product we sell from a food safety standpoint back to your specific farm and field.